Hubble Space Telescope: Reaching For The Ring. One of the most popular targets for all amateur astronomers is the “Ring” Nebula. Also known as M57, this incredible planetary nebula has sparked our imagination like no other.It’s achieved that with its distinctive shape and ability to resolve. Now the Hubble Space Telescope has taken a new look at it and is showing us even more. 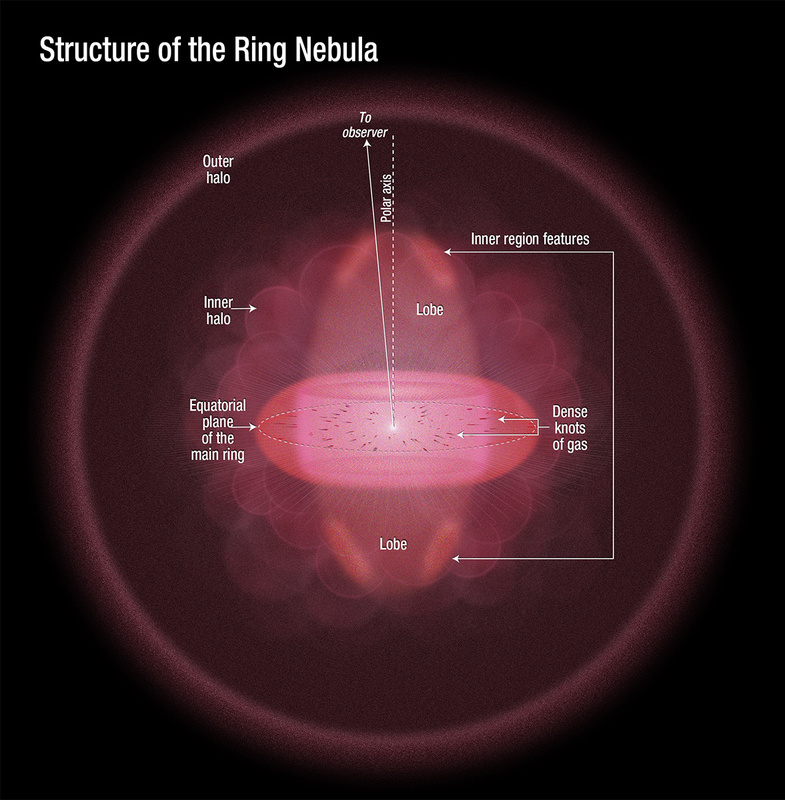 “The nebula is not like a bagel, but rather, it’s like a jelly doughnut, because it’s filled with material in the middle,” said C. Robert O’Dell of Vanderbilt University in Nashville, Tenn. He leads a research team that used Hubble and several ground-based telescopes to obtain the best view yet of the iconic nebula. The images show a more complex structure than astronomers once thought and have allowed them to construct the most precise 3-D model of the nebula. Situated about 2000 light years from our solar system, it’s amazing to think we can see its 1 light-year span with even a small telescope. Over the years, M57 has been the target of many professional telescopes and they have detected a field of gas in the central region. Through the use of Hubble’s Wide Field Camera 3, we’re able to see things in a different light as the distinctive structure is even more detailed. Where we once thought the core was round, O’Dell’s team feels the structure wraps around an elongated shape – similar to a football. This stretched central region then extends through the opposite sides of the ring. Thanks to its positioning, our observations allow us to see the Ring Nebula face-on. According to the news release, the blue tones in the image are the result of helium. At the heart of the nebula is a white dwarf star – the tiny dot in the center – and it powers the helium glow. The star itself is nothing but a left-over… the end product of a sun-like star which has used up its hydrogen fuel and expelled its outer layers. Once the gas is gone, it goes into a gravitational collapse and becomes a compact object. Even though astronomers thought they knew everything about M57, O’Dell and his team found unexpected features like dark, irregular knots of dense gas embedded in the inner portion of the ring, “like spokes on a bicycle wheel”. These gas filled marks are the result of where hot gas streaked through their cooler counterparts as they left the star. They remain because they are less likely swept away by the star’s ultraviolet light production. The Hubble’s composite imaging techniques have permitted the researchers to combine data and reveal these “spikes of light”. It’s a phenomenon also found in other planetary nebula. Along the outside, the ring structure was created when speedy gases encountered slower moving counterparts. It’s a race which is run at the pace of about 43,000 miles per hour and the middle of the pack is moving much faster than the main portion. For at least another 10,000 years it will continue to expand – a relatively short time compared to the life of a star. Eventually the Ring Nebula will simply fade away… becoming part of the interstellar medium. Studies done now will help us understand what might eventually happen to our own Sun in another 6 billion years. But don’t get any ideas that Sol’s end will be quite so fancy. It’s smaller size will make its final years less dramatic. Original Story Source: HubbleSite News Release. Submitted by Tammy Plotner for “Dave Reneke’s World of Space and Astronomy News”.